The Lahore Metro Bus System is a rapid transit bus system being built in the city of Lahore, Pakistan. The Turkish firm Ulasim and NESPAK are consultants on the project. The construction work is being managed by the HUD & PHE Department through TEPA . When completed, it will consist of 27-kilometres long road track for the Metro Bus Service, from Gajumata to Shahadra, out of this track 8.5 km is elevated .Travel time for the 27 km will be one hour. It has 29 bus stations and e-ticketing and Intelligent Transportation System are part of the MBS. Whereas all IT part is being carried out in coordination with Punjab IT Board. 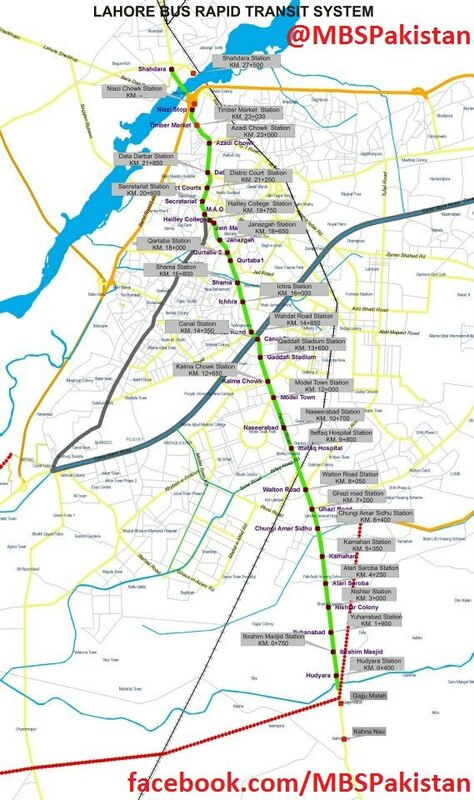 Lahore Transport Company (LTC) has defined two corridors, on which the Bus Transit will run: Ferozepur Road line extending 28 km and Multan Road Line extending 12 km. The project will be implemented on Build-Operate-Transfer basis. Approximate cost of this project is Rs.25 Billion. Work on the project is in full swing. 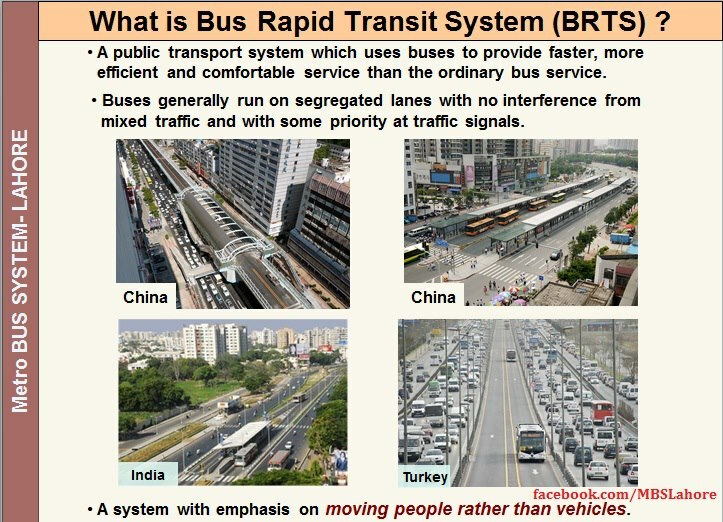 Mayor of Istanbul Kadir Topbas announced a gift of 100 buses and inaugurated the Bus Rapid Transit (BRT) system. 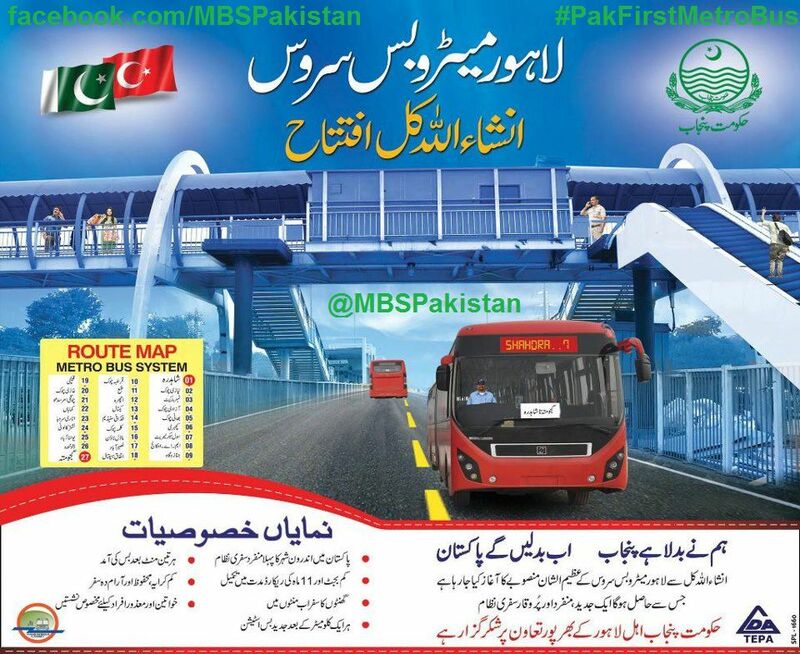 The Metro Bus System is being inaugurated on February 10, 2013. Upon completion it would be the 1st Rapid transit system in Pakistan. A test run of the articulated buses was conducted on 25th December 2012 from Gajjumata to Kalma Chowk Fly Over. The Chief Minister of Punjab Shahbaz Sharif drove the bus from Chungi Amar Sidhu to Gajjumata. Six of the 45 buses, each having a capacity of 150 passengers, have reached Lahore. An independent security has been established for this project. Pakistani media, people of Lahore and other major cities have praised the initiative by CM Shahbaz Sharif who is determined to develop the same kind of transit system in Karachi and then other major cities of Pakistan including Rawalpindi, Peshawar etc. While the service has been reviewed by major tv channels, the one month free trial by common people will be real test. Twenty-six bus routes and eight van routes will serve as feeder routes for the Metro Bus Service. The routes will be operational within a few days of the launch. Some brand new routes would also be started for potential MBS users who don’t live close to the 27-km track. Eight of the feeder routes are on narrow roads which can’t take buses, so low occupancy vehicles (LOVs) – or vans – will be operated on these routes. All 34 routes would operate with regular fares, LTC officials said, emphasising that they would not be free for the first four weeks, like the MBS. LTC Chairman Khawaja Ahmad Hassaan said that details of feeder routes would be put up at each station. New routes would be created and old ones closed down depending on need. He said that good quality vans would be operated on the LOV routes. “These routes are currently mainly served by Qing Qi rickshaws. The LOVs will replace the rickshaws, which will still be able to cover the streets within neighbourhoods to take people to the feeder routes,” Hassaan said. The LTC chairman said that he expected between 20,000 and 40,000 people a day to use the MBS service in its early stages. He said that the 45 articulated buses brought in for the MBS could carry 112,000 people per day, but was confident that the use of the MBS would quickly exceed that capacity. Istanbul built a 42-km bus track and expected it would be used by up to 300,000 people a day, he said. It is now being used by 750,00 a day.